Lead time for this product is 5 - 7 Business Days. Philips Trim Touch Lead Wires - item #989803129161, item is a complete lead wire set for Philips Trim, Trim I, Trim II (989803130101), Trim III, PageWriter TC30, PageWriter TC50, PageWriter XLi M1700A, PageWriter XLE 1702A, Touch EKG Machines. Also suitable for Sonosite ultrasound machines. Stimulator & Electrode Accessories can be found in our extensive online collection of products from globally recognized and trusted brands, including Philips. 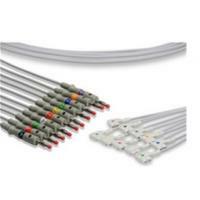 An excellent option to consider is the Philips PageWriter Trim/Touch/XLI Complete Lead Wire Set - 10 Leads.